Albuquerque Isotopes manager Lorenzo Bundy has been selected to coach some of the best young baseball talent from throughout the globe as a member of the World Team coaching staff at the XM Satellite Radio All-Star Futures Game on July 10, part of the festivities surrounding the Major League All-Star Game at Chase Field in Phoenix, Arizona. In its 13th season, the XM Satellite Radio All-Star Futures Game is a nine-inning contest between top Major League prospects from the United States on one team and from various countries throughout the world on the other. This year's game will be played on Sunday, July 10 at 3:00 pm at Chase Field, home of the Arizona Diamondbacks. Bundy is no stranger to international baseball, having been a successful manager in the Mexican Pacific League nearly every winter since 1991. He won the Mexican Pacific League championship in 1999 and has twice been named the league's Manager of the Year. 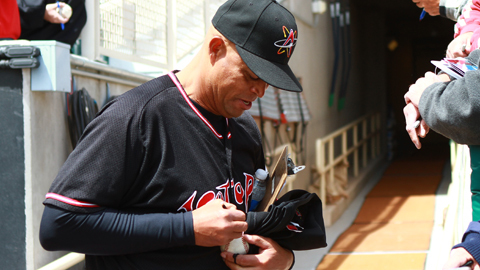 The last three years, Bundy has managed for Mazatlan, who he led to a championship in 2008. It promises to be a busy week for the Isotopes manager, who will leave the Futures Game for Salt Lake City, UT where he will be the manager of the Pacific Coast League team in the Triple-A All-Star Game on Wednesday, July 13. After an eight-game stretch that includes games in Iowa and Omaha, the Isotopes are back home on July 4 for a seven-game homestand that kicks off with the biggest and most spectacular fireworks show of the season. Tickets for any Isotopes game may be purchased at the Isotopes Park Box Office, at Ticketmaster outlets, by phone at 1-800-745-3000, or on-line at www.albuquerquebaseball.com or www.ticketmaster.com.